These Color Coded Raymond Blue Die Springs are made of high tensile strength chromium alloy steels. Optimal wire cross section. Spring ends are ground square. Dimensional requirements remain consistent and measurably the same from one batch of springs to the next. Engineered to better withstand shock loading. Designed to endure constant high-speed deflections. Shot-peened to increase fatigue life for less downtime. From Jerome Bauman of Buffalo, Minnesota on 11/5/2018 . 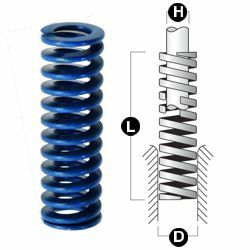 Have used these springs for years now in a manufactured product and have had no issues or complaints.